This famous Institution, the predecessor of the Teutonic Order, occupies in history a far more important page. Its origin falls in the time when Jerusalem was still in the hands of the Mahometans, a.d. 1048. A number of merchants from Amalfi, by consent and gift of the Khalifs, founded, not far from the Holy Tomb, a Benedictine cloister, consecrated to the Holy Virgin, with a chapel in honour of St. John the Baptist, and a hospital for the reception of pilgrims, which they confided to the management of the monks. In 1099 Godfrey of Bouillon having conquered Jerusalem, gave to the hospital a constitution, endowed it with considerable lands and capital, and released the monks from the duties of its management, which now devolved upon several of the Knights of his army, who soon formed themselves into a spiritual order, that was confirmed, in 1113, by Pope Paschal II. The members, who made the vows of obedience, chastity and poverty, divided themselves into three classes. 3. Brother servants entrusted with the care and nursing of the sick in times of peace, who served as inferior warriors in times of war. Subsequently, a fourth class was created for subordinate menial duties and labours — that of Donatists. The original costume of the Order was a black coat, a cloak with a pointed hood, adorned on the left side towards the heart with a small white cross, (that of the Donatists with only half a cross), as also with a golden cross in the middle of the breast. In war, the Knights wore splendid armour, and a red over-garment adorned with a silver cross. The Knights of St. John, in conjunction with the Templars and other Knights, (with whom they lived, however, in continual conflicts) succeeded for a long time in keeping in their hands the tottering throne of Jerusalem, for which cause they fought with such admirable zeal, that many places in the Holy Land have now become monuments of their valour—more especially Jerusalem (1152), Ascalon (3153), Balbais (1118), Hittin (1187), &c.; nor did they retire — as the other Knights and secular Princes did — from the campaign even after Soliman had, in 1187, conquered Jerusalem. They greatly harassed the Turks, first from Margat, then from Acca (Ptolemais), in which last place they maintained themselves for nearly a whole century. After the loss, however, of Ptolemais, the last refuge of the Christians in the Holy Land, Villiers, the Grand Master, saved himself with the remnant of the Knights in the island of Cyprus, where king Lusignan consigned to them the half demolished town of Limisso. There they built a fleet, and soon became one of the first maritime powers in the Mediterranean. In 1308, their power was increased by its union with the Order of St. Samson of Jerusalem. The Grand Master, Villaret, now resolved to remove his residence to Rhodes, which the Saracens had taken from the Greek Emperor Andronicus. The Pope approved of the plan, promised support, and vested in him the right of appointing the future Archbishop of Rhodes. The knights succeeded in conquering (15th August, 1309) the island, whence they called themselves the "Knights of Rhodes". The Council of Vienna conceded to them (1311) the greatest part of the possessions of the dissolved Order of the Templars, at which period their power may be said to have reached its zenith. In a glorious battle (1321) Gerard du Pius, the Vicar General of the Order, destroyed the great Moslem fleet, and in conjunction with the Venetians and the King of Cyprus, the Knights conquered (1341) Smyrna; which Timur, however, wrested from them after an obstinate resistance. The same Vicar General freed the King of Armenia from the Turks (1347), destroyed the fleet of the Egyptian pirates in the harbour of Alexandria, and conquered that town (1365). He likewise destroyed, near the island Longo, the fleet of Sultan Al Nager al Daher (1440), and repulsed successfully four years afterwards a second attack of the Sultan upon Rhodes. Even Muhamed II when he besieged (1480) Rhodes with one hundred thousand men, and one hundred and sixty ships, was compelled to raise the siege, after having sufl'ered heavy losses; and when after his death, the fraternal disputes about the crown and empire compelled the younger Prince Zizim (1482) to take refuge at Rhodes, placing himself under the protection of the Grand Master, the latter demanded and received 35,000 ducats from the victorious Bajazeth for the annual support of his younger brother, besides 10,000 ducats as indemnity for the expenses of the last war. In 1485, the Order received a further accession of wealth and power, by the Pope's grant of the possessions of the abrogated Order of the "Sacred Tomb" and "St. Lazarus." In 1501, the Grand Master d'Aubusson was appointed Generahssimo of the troops of the combined Princes against the Mahometan pirates; and a few years afterwards, the Grand Master, Emmerick of Amboise, fought and won the great naval battle against the Egyptians, near the Port Lajazzo in Caramania. Internal dissensions, however, added to the arbitrary dispositions of the Popes, greatly tended to weaken the power of the Order in latter times. Soliman II. attacked Rhodes in 1522, with a fleet of four hundred sails, and an arnjy of one hundred and forty thousand men. That place was defended only by six hundred Knights, and four thousand five hundred soldiers of the Order. The Sultan would probably have raised the siege of a place which was so obstinately defended by the brave Knights, who repeatedly inflicted heavy losses upon his troops, had it not been betrayed by the Chancellor of the Order, Andreas of Amaral, who, out of revenge for not having been elected Grand Master, pointed out to the enemy a weak point in the fortifications, by which the Turks entered, as the head of the traitor was fall in by the hand of the executioner. The brave Knights, even at that critical moment, obtained terms of capitulation and free retreat. They left their residence, now a complete ruin, which they had gloriously maintained for nearly two hundred and twenty years, in fifty vessels which brought them, and four thousand inhabitants of the place to Candia. Thence they repaired to Venice, Rome, Viterbo, Nizza, Villafranca, and Syracuse; until 1530, when the Emperor Charles V, enfeoffed them with the island of Malta, together with Tripolis, and the islands of Gozzo and Comino, under the condition that they should wage an incessant war against the pirates and infidels. In this their new residence, they served for a long time for Europe, as a strong bulwark against the Turks ; they were courted by the monarchs of Protestant Europe, despite the slur cast upon their religious principles, ever since the introduction of the Reformation in England, Germany, and the Northern States of Europe, and notwithstanding the loss of Tripolis (1552) which was wrested from them by Dragut, the Saracen General. During the whole of the 17th century, it was, indeed, by their assistance alone that the European powers, each and all, were enabled to make head against the powerful Turks, and finally succeeded in expelling them from Candia, Prevesa, St. Maura, Koron, Navarin, Modon, and Chio. Nor are there wanting brilliant pages in their history as late even as the middle of the eighteenth century, though the Order had then greatly suffered by the moral degeneration of its members. 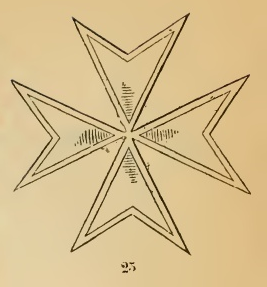 The events, however, of 1761, by which Malta and the Order were only saved from total destruction by the intercession of France, sufficiently testified to the utter decline and fall of that gigantic institution, while the Turks, themselves, thenceforth began to look at the Knights of Malta no longer as dangerous enemies, but as mere troublesome, factious, and quarrelsome neighbours, whom they were obliged to spare and leave unmolested, simply because they were protected by the great powers of Europe. The French Revolution deprived the Order of all their privileges and possessions in France, (19th September, 1792) while in 1798, Malta fell into the hands of Napoleon by the cowardly capitulation of Baron Hompesch, their Grand Master. Though the Emperor Paul of Russia declared himself in the same year Grand Master, and though Malta was conquered by England in 1801, it was never returned to the Order, which was deprived, at the same time, of its possessions in Germany, by the Princes of the Rhenish Confederation. Having thus lost all political importance, the Order was no longer headed by a Grand Master, but by a deputy Grand Master, who resided from 1805 to 1814 at Catanea and afterwards at Ferrara. In more recent times, some of its possessions in Lombardy, Parma, Modena, Lucca and Naples, were restored. The Order still exists in those states, as also in Bohemia, Russia, and Spain, though under a modified constitution, and in separate bodies. Since 1831, the Deputy Grand Master has resided at Rome. The members are divided into professed Knights, i.e. Knights who have really sworn to the constitution and made the vows prescribed by the statutes, and honorary Knights who are merely allowed to wear the dress and insignia without strictly belonging to the Order. The favour is granted to Catholic noblemen of honourable reputation, and of noble descent by both parents. The first class only exists in countries where the Order is still in possession of some landed property. The costume of the Knights of the first class, consists of a frock-coat of scarlet cloth, with white lining, facings, collar, hat and plume. That of the second class is a similar coat, but with black velvet lining, facings and collar, and a black hat and plume. Both classes have white hat flaps, epaulettes with thick golden tassels, buttons, spurs, and hat string equally of gold, pantaloons of white casimir with golden trimmings. The decoration (Nos. 23 and 24) is a white octagonal cross suspended by a black ribbon ; but the embellishments attached to it, are different in the different countries where the Order exists ynder royal authority (See Spain and Prussia).